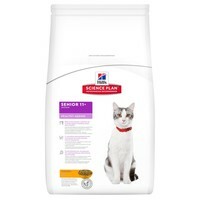 Hills Science Plan Senior 11+ Healthy Ageing Adult Cat Food (Chicken) has been formulated using precisely balanced nutrition to support healthy brain and kidney function. Containing precise levels of energy, protein, vitamins and minerals, Hills Healthy Ageing has been developed especially for the older cat from 11 years old to help them tackle the changes that ageing can cause. L-carnitine for lean muscle mass. The controlled minerals help contribute towards a healthier urinary system. Poultry meat meal, maize, maize gluten meal, rice, animal fat, wheat, digest, minerals, fish oil.